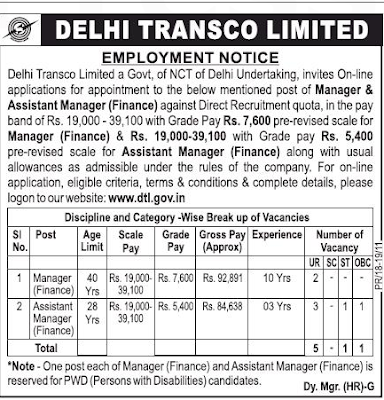 Delhi Transco Limited Recruitment 2018: Latest Delhi Transco Limited Openings for Assistant Manager/ Manager (Finance) has been professed!!!! Aspirants looking for job in this reputed organization must apply for Delhi Transco Limited Recruitment. Candidates who are going to apply for Delhi Transco Limited Assistant Manager/ Manager (Finance) Recruitment have to fill the application form through online mode. You have to fill the Delhi Transco Limited application form before the last date. Also aspirants must possess relevant year of working experience in particular field. Through Delhi Transco Limited hiring process, organization intends to hire keen aspirants who can justify the job profile of vacant positions. Select ‘current opening’ link from the drop-down list. Read complete DTL Jobs Notice carefully, and check your eligibility criteria. Candidates who want to attain more information regarding the Delhi Transco Limited Recruitment 2018-19 may visit the Official Link of the organization. Also stay in touch to get all the latest updates time to time.